Apart from cancelling 27 trains, the railways also diverted many others to Tarn Taran and Beas to continue their onward journeys while others were short terminated at Jalandhar. 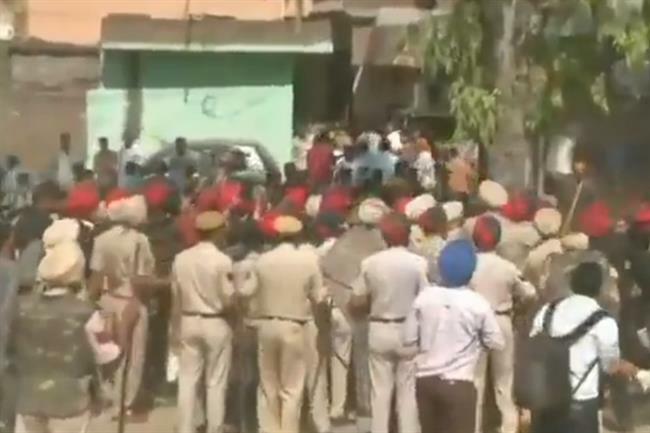 Amritsar: The Punjab police on Sunday fought running battles with people who had blocked rail tracks at Amritsar demanding action against organizers of the Dusshera committee following Friday’s accident that claimed 61 lives. The district administration said 40 of the dead have been identified while the process of identifying the others was underway. The protesters also demanded against authorities for allowing the Dussehra celebrations near the rail tracks. Angry locals had warned that they would not let any train pass on the route unless their demands were met. They were also demanding that missing persons be traced and adequate compensation given to the families of those killed after a Jalandhar-Amritsar train ploughed through a crowd watching Ravan’s effigy being burnt.. The blockade had forced the railways to cancel 27 trains since Saturday. Two policemen, including a Punjab police commando were injured after the protestors pelted stones at police party which tried to clear the railway route for the resumption of rail traffic. Reinforcement led by deputy commissioner of police (DCP-City) Amrik Singh Pawar after the police came under attack and cleared the track. Police also cordoned off the Dhobi Ghat area and Jaura Fatak and made public announcements that no one should come out from their homes near the railway track. Apart from cancelling 27 trains, the railways also diverted many others to Tarn Taran and Beas to continue their onward journeys while others were short terminated at Jalandhar, railway officials said. Earlier in the morning, police said they were hoping that the protest would peter out later in the day. “We hope that the normalcy will be restored in the area by Sunday evening as the number of protestors has come down since Saturday,” a senior police officer said according to PTI. The situation had been peaceful but tense before some of the protesters began throwing stones. About 500 protesters, mostly young men, had blocked the rail tracks at the accident site and had raised slogans against the administration and the railways. Shops near the Joda Phatak area remained closed. “Two labourers who were living in my area are still missing,” Kamal, who lives near Joda Phatak was quoted as saying by PTI. Kamal raised apprehensions that the death toll could be higher than the figure given by the government. Another local, named Raju, said a man was still looking for the body of his father who died in the incident. “He had gone to collect a piece of cloth to cover the body of his father, but when he returned he could not find the body,” said Raju. Another man was inconsolable. He could just find the slippers of his brother Sonu. He carried the slippers to the police station and pleaded to help him find his brother. Family members of the victims said that Punjab cabinet minister Navjot Singh Sidhu and his wife Navjot Kaur, who was the chief guest at the Dusshera function on Friday evening, had not even bothered to meet them despite their loss. “These people (political leaders) only come for functions or to beg for votes. No one has come to be with us in our hour of need and grief,” Pradeep Sharma, an area resident was quoted as saying by IANS.